The media is featuring pieces on everybody thinking of running for the 2020 Democratic Presidential nomination…. One should be aware that some of these people have absolutely NO chance of getting that nomination…. Mike Bloomberg and all his money? 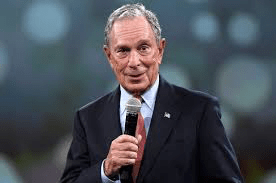 Mike Bloomberg was the REPUBLICAN Mayor of New York City for 12 years…. That was back in the day…. THAT is not gonna work now…. How many Democrats are gonna cast a vote for a guy RICHER that Donald Trump? Here’s a look at the former ‘Big Apple’ Mayor from The Hill…. A key question looms as former New York City Mayor Michael Bloomberg weighs his options in 2020: whether a centrist and a billionaire Democrat has room in a party that has veered sharply to the left. Bloomberg, 76, has been an outspoken critic of President Trump and has touted his long record on advocating for gun control and combating climate change, both issues that could win over base voters. But those same voters might be turned off by his hard-charging criticism of progressive policies such as “Medicare for all,” a wealth tax and free college tuition. Still, some Democrats see a narrow, but viable path for a candidate who campaigns on being pragmatic at a time of sharp political divisions, though it could grow a bit more complicated if former Vice President Joe Biden decides to run for the White House. “He’s going to bring a lot to the table for progressive voters. But he’s going to have to confront those vulnerabilities,” said a national Democratic strategist, adding that Bloomberg is going to have to address parts of his record including his previous party affiliation. “It’s a narrow path, but the reality is all these folks have a narrow path.”…. While think he has no chance? The economy COULD use his spending on a run though….